American politicians remorselessly claim that theirs is the ‘greatest country’ and the ‘American way’ is the best way. But if so it poses a puzzling question – ‘why do American’s die so young’? The significance of the question can easily be seen by looking at the facts. Figure 1 show life expectancy in the major advanced countries – the G7. An average American has a life expectancy of only 78.7 years – compared to 83.8 years in Japan, 83.5 years in Italy, 82.7 years in France, 82.1 years in Canada, 81.6 years in the UK, and 81.1 years in Germany. The US is the only G7 country with a life expectancy of less than 80. So, if the ‘American way’ is the ‘greatest’ it means that Americans chose to die young – an apparently bizarre choice. But detailed examination shows the situation of the US is even more serious. Life expectancy is the most sensitive of all indicators of overall social well-being because it sums up in a single figure all positive social trends (high income, good health services, good education, environmental protection etc.) and all negative ones (poverty, bad education, poor health services, pollution etc.). ​International data shows clearly that the single biggest factor in a country’s life expectancy is per capita GDP – in 2015 this explained 68%% of differences in life expectancy. Indeed per capita GDP is quite literally a matter of life and death. A person in a low-income economy by World Bank standards lives 61 years and 8 months, while a person in a high-income economy lives 80 years and 10 months – a difference of 19 years. Interestingly the difference in life expectancy between poor and rich borough in US and UK cities is also around 20 years. ​Nevertheless, although per capita GDP is by far the largest factor in life expectancy, if a country has a higher life expectancy that would be predicted from its per capita GDP this indicates that other social and environmental factors are better than average and adding to life expectancy; if a country’s life expectancy is lower than would be predicted from its per capita GDP this indicates social and environmental factors are lowering life expectancy. ​AS that the US has the highest per capita GDP of any major country it would therefore be expected that its life expectancy would be the highest of any major country. But the facts show that that the US has a much lower life expectancy than any other G7 economy – as the chart shows.  ​To show how much shorter US lives are than would be expected from US per capital income two methods can be used – each of which yields the same essential result. First, as per capita GDP accounts for a large part of life expectancy it is possible to predict what a country’s life expectancy would be from its per capita GDP. Second, a country’s rank in world per capita GDP can be compared to its rank in life expectancy. Thus, if a country ranks 30th in terms of GDP per capita, but it ranks 15th in life expectancy, its life expectancy is longer than would be expected from its per capita GDP, and if it ranks 30th in per capita GDP but 45th in life expectancy its life expectancy is lower than would be expected from its per capita GDP. Table 1 shows the result of doing this and it yields extremely striking results. Average life expectancy in the US is four years less than would be expected from its per capita GDP. The US also ranks 8th in the world in terms of per capita GDP but 39th in terms of life expectancy – that is the US rank in life expectancy is 31 places lower than its position in per capita GDP. This US data is by far the worst for any G7 country. The G7 countries which have a higher life expectancy than the US all achieve this not by having a higher per capita GDP than the US but by having better social and environmental conditions – shown by their having a rank in life expectancy that is far higher than their rank in per capita GDP. Therefore social, environmental etc. 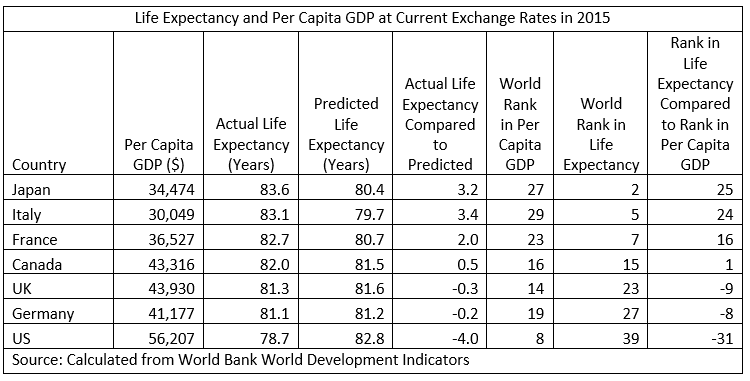 conditions in these countries are far more conducive to a long life than the US despite having lower per capita GDPs. The US performs far worse than any other G7 country. Which brings us back to the starting point. Common sense of course shows that Americans have no aberrant desire to die early. Like everyone else they would like to live as long as possible. The fact Americans die earlier than those in the other major advanced economy is simply showing that the combined effects of the US private health care system, US pollution, US poverty and interlinked ethnic discrimination, the US’s high level of civic violence means Americans die far younger than would be expected from the country’s per capita GDP – and younger than in other comparable economies. It turns out the ‘American way’ literally subtracts from the life of Americans. ​This, of course, has implications for choices for China.As China’s GDP grows its life expectancy will increase. But some people urge China to adopt features of the ‘US model’ as it develops – a system based on private medicine, no welfare state etc. But why should China adopt a model in which its citizens will die earlier than in other advanced economies? And if China is to adopt a model, as it develops, in which its citizens are condemned to an earlier death than necessary shouldn’t this be explained clearly to China’s people? People in China, of course, in this are no different to other people. They would actually prefer what Americans would if given the choice – to live the longest possible lives. Therefore looking at the question of ‘why do Americans die so young’ has very important implications for China itself. ​And for Americans it turns out that Americans lives are victims of the ‘American way’. The original Chinese version of this article appeared at Sina Finance Opinion Leaders of 22 August 2017.